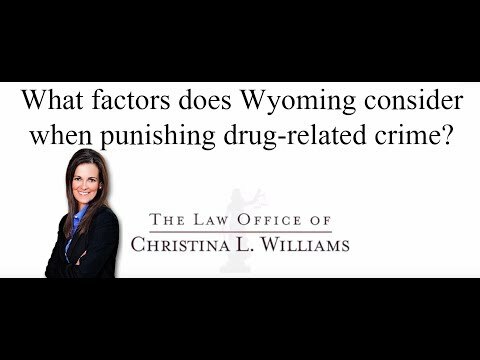 What factors does Wyoming consider when punishing drug related crime? If you are charged with a drug related crime in Wyoming, the state is going to look at the nature of the offense and your criminal history. Specifically, do you have prior drug related convictions or do you have prior related convictions that are felonies. If you do have a prior history and you are charged again with a procession, it can potentially be a felony. That is, a third possession in Wyoming can be charged as a felony possession. It’s also a factor to look at how much of the illegal controlled substance you were in procession of. It it’s over a certain amount, regardless of your history, it can be charged as a felony. A large enough amount of an illegal controlled substance makes it a felony as well. The court will also look at whether or not you were in procession of the illegal controlled substance for personal use or were you in control of the substance for the purpose of distributing or selling the illegal controlled substance. These are all factors that are considered in the prosecution of a drug related case.